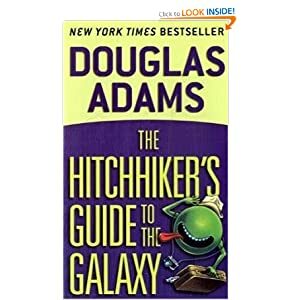 Douglas Adams is the famous author of The Hitchhiker’s Guide to the Galaxy, the source of many memorable quotes among which the most notable may be, “DON’T PANIC,” which appears on the front of the fictional guide in large, friendly letters. Google marks what would have been Adams’ 61st birthday today with one of its fascinating interactive Google Doodles, which will be a hoot for Hitchhiker fans who corporately may waste countless of otherwise productive minutes clicking on the virtual Guide. Adams wrote memorable quotes of comic genius, but he was also a celebrated atheist who clearly conveyed his worldview even–or perhaps especially–in his humorous quips. Citing 42 as the answer to life, the universe, and everything in it may be funny, but it’s also sad. The true answer expands exponentially beyond a mere numeral to glimpse God, who created it all. He gave life to Douglas Adams and he took it from him again in what some call an untimely death at age 49 on May 11, 2001. But we know that every day of every person has been ordained by God. Psalm 139:16 says that in God’s book “were written, every one of them, the days that were formed for me, when as yet there was none of them” (ESV). Adams’ life and work was not meaningless. God uses unbelievers as well as believers to accomplish his purposes. Even the most imaginative and creative minds cannot begin to fathom how God uses all events and people for the church’s good and his own glory. This morning, as I see that a speaking engagement is suddenly NEXT WEEK, God used a dead atheist to encourage me: DON’T PANIC (in large, friendly letters). Adams work is not meaningless as with all art, it has the ability to touch and lift up the soul. Regardless of my beliefs or how they differed from his, the stories he told are full of humor and inspiration. You may see a life reduced to “dead atheist” but I see a man who helped save animals and inspire me to rise above those who tried to bully me. Thanks for commenting, Joe. I agree that Adams’ work is not meaningless. I shared one way it had meaning for me today, but I enjoy his humor and appreciate hearing how you have profited from his work.